Less than a year after its unveiling, Apple's Swift programming language has not only received widespread acceptance but has also become one of software developers' favorite tools, data from a recent survey shows. 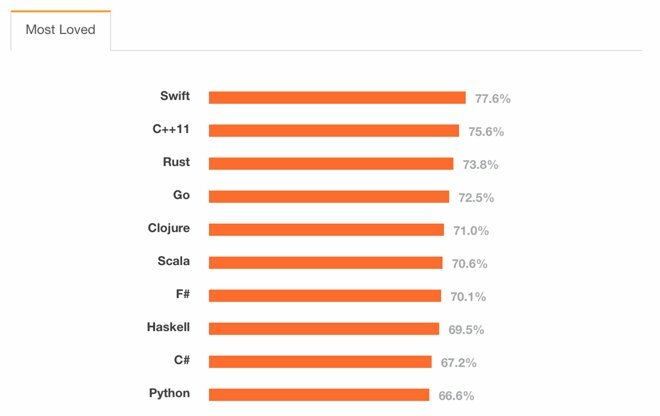 Some 78 percent of programmers currently working with Swift were eager to continue developing with it, according to Stack Overflow's 2015 Developer Survey. The data was collected from over 26,000 Stack Overflow visitors in 157 countries, though not all of those respondents were Swift users. Already one of the most popular languages, Swift is featured in apps from numerous well-known brands including American Airlines and LinkedIn. The most recent iOS 8.3 update brought "noteworthy" updates to the language, which has quickly progressed to version 1.2. Swift's older cousin, Objective-C, did not make the top ten most-loved list. Objective-C developers did make the most money among U.S. respondents, however, with an average pay— including bonuses— of just under $99,000 per year. Of those who identified themselves as full-time mobile developers, 33 percent worked primarily on iOS, compared to 45 percent who worked primarily on Android. 20 percent were nonpartisan. Mac OS X was the operating system of choice for 22 percent of respondents, slotting Apple's desktop platform in behind Microsoft's Windows 7, which took 39 percent of the vote, and just ahead of Linux's 21 percent.